Aphids are usually found on the new growth tips and on the undersides of leaves. These sucking insects may appear green, tan or black, depending upon the species and may be present in a winged for wingless form. Plants that are heavily infested may also be covered with a black sooty mold. This mold grows on the secretions left by the aphids call ‘honeydew’. Control with insecticidal soap, horticultural oil, and sticky cards. A systemic insecticide added to the soil also helps. Fungus Gnats resemble fruit flies as they dart rapidly among the plants. Although the flies themselves do not damage the plants, they are an annoyance. Large numbers of fungus gnat larvae, which live below soil level, can cause damage as they feed upon the roots. The adult fungus gnat moves quickly so spraying them is difficult. The best method of control is by eliminating or reducing the number of larvae present. Wet soil provides the best breeding conditions for fungus gnats. Allow infested plants to dry thoroughly between watering. “Catch” and destroy larvae by placing an inch wide slice of white potato on the top of the soil. The worm -like larvae come to feed on the starchy potato. Check the potato every day, replace it frequently, and discard the larvae found underneath feeding on it! The addition of sticky cards just below the plant canopy will help catch some of the adult fungus gnats, too. Spider Mites are very tiny spiders that feed by piercing the leaves and sucking out sap. Evidence of spider mites might be the presence of light webbing under the leaves or a yellow speckled appearance to the foliage. High infestation will cause brown edges or tips or loss of the entire leaf. The best way to check for spider mites is by lightly tapping a leaf over a white piece of paper. The mites will appear as tiny reddish brown moving specs. Control is best achieved by spraying the underside of leaves with insecticidal soaps or horticultural oils. Scale larvae (called crawlers) are generally not visible to the naked eye as they feed upon our plants. Once the feeding is done, a waxy hard shell is constructed under which eggs are laid for the next generation. It is this brown or yellowish shell which is usually noticed. These shells appear different in color or shape depending upon the type of scale insect present. 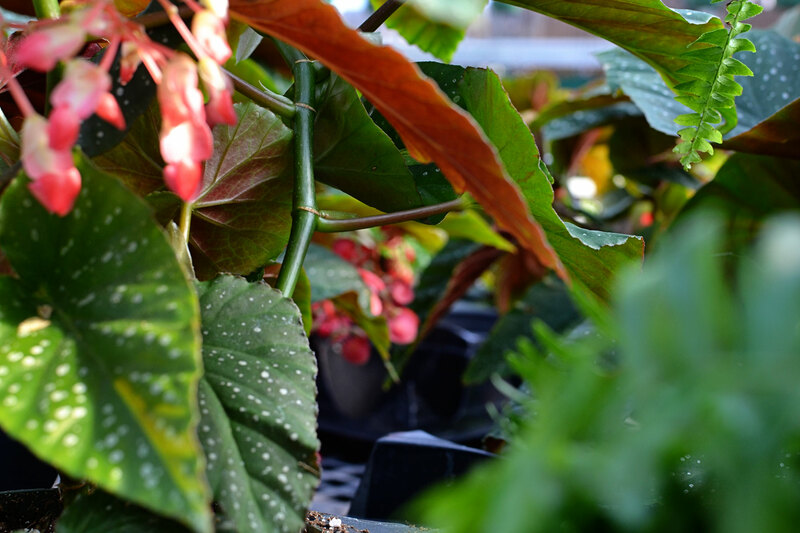 Crawlers can be controlled with most insecticides labeled for houseplants. The shells can be wiped with a cotton ball dipped in alcohol or sprayed with horticultural oil. The oil serves as a coating to “smother” the eggs and works to kill the emerging crawlers. Mealybugs are also scale insects and are pink or light brown in color. These tiny insects hide under their whitish wooly secretions. Mealybugs can be found on the underside of leaves or in colonies at the base of the plant. These wooly balls can even be found under the rim of the pot! Dabbing the individual wooly spots with a cotton ball dipped in alcohol or spaying the plant regularly with insecticidal soap helps, but a heavy infestation is very difficult to overcome. These pests spread quickly from plant to plant, so isolate any infected plants. Many times, destroying the infected plant is the best control! Whiteflies hide under the leaves in clusters and fly quickly when disturbed. Eggs are also laid in clusters on the undersides of the leaves. Whiteflies are also sucking insects. Spraying the adults with permethrin, insecticidal soap or horticultural oil will achieve some control. Because whiteflies reproduce quickly, applying a systemic insecticide to the soil seems to be the most effective way to break the reproductive cycle. A plant removed from its pot shows a soil ball entirely covered with roots. Roots are emerging from the drain hole. Leaves are small, blooms are scant or new growth is minimal. Roots appear blackish or you notice an unpleasant odor to the soil. It has been more than a year since the last re-potting. Start with a well- watered plant. 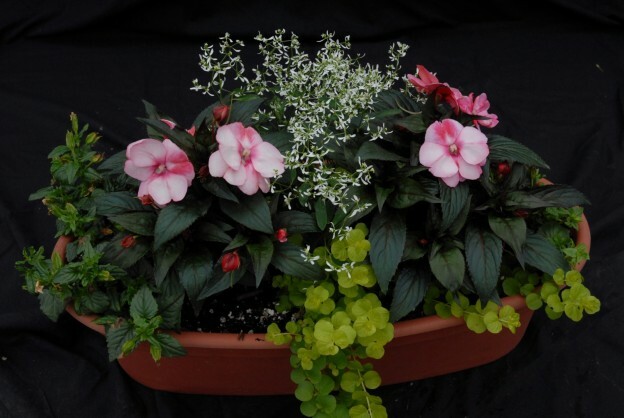 Choose a pot that is 2-4 inches larger than the old pot. Make sure the pot you intend to use is sanitized. Used pots should be cleaned thoroughly and soaked in a solution of 1 part bleach to 9 parts water for 10 minutes. Carefully remove the plant from its old container. Hold your hand over the surface and support the plant with two fingers. Transplanting large plants is a two- person job. Lightly loosen tightly root balls by carefully pulling the roots apart. No need to remove any healthy roots. Use a soiless potting mix. Garden soil contains weed seed and compacts down too much for houseplants. Keep the plant at the same soil level as before. Avoid planting the plant too deeply. Lightly tapping as you add soil will help fill in the air pockets. Remember packaged potting mix comes to you very dry. Water newly transplanted plants immediately.